My oldest daughter was home sick from school this week, and so we had a chance to do some reading together. It was my turn to pick the book and I was so delighted to share one of my all-time favorites with her. 5 stars: If you haven't read this one, you're in for a treat! The Casson family are all artists, to one extent or another, and live in the Banana House (so named because it's inscribed over the door, though no-one knows why). Well, all except Bill--the father. Bill lives in a studio apartment in London during the week, being a proper artist, and only comes home on weekends (and for certain midweek emergencies.) Eve, the mother, prefers to paint in the garden shed in the backyard. She has always believed her children are more clever and capable then herself, and thus lets them do exactly as they please. All of the children are named after paint colors. Cadmium Gold, or "Caddy," the oldest: taker of many, many driving lessons--but not the test, fixer of her siblings problems, mother hen, and guinea pig breeder. 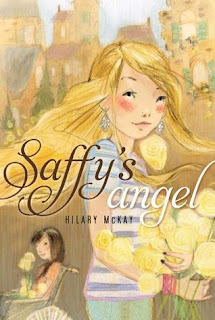 Saffron--Saffy--comes next. Her world is rocked when she finds out she was adopted as a 3-year-old, and that her siblings are actually her cousins. Indigo: the only boy, dreams of being an explorer despite his many fears; fiercely protective of his sisters, who make up his pack. And then there's Rose. Permanent Rose; stubborn, completely self-assured, sensible (in her own way), Rose. 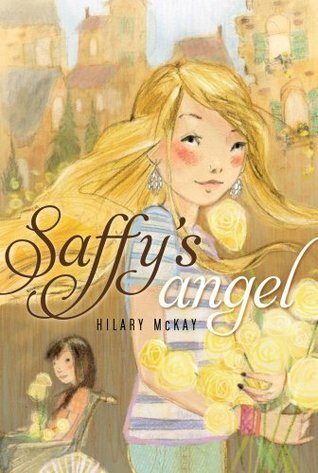 When Saffy learns of an angel--the angel in the garden--left to her in her grandfather's will, it sets in motion a chain of events that brings a new friend into her life, takes her to Italy and back, and helps her finally discover her place in her family. I have adored this book ever since I first read it, and all of the times since. It's not very long, but it has so much heart! That was really cheesy. I stand by it. It was just magical to read it with my 9 year old daughter. She laughed--with me--in all the right places! It was one of those books where the characters are drawn so well, that at the end, you say things like, "Well, that's Rose for you." We couldn't decide if our favorite parts were the driving lessons, or Rose's notes, or the trip to Italy, or... I'm so happy to have read it again, and so SO happy that my sweet daughter shared in that experience with me. There are 6 books total in there series: a prequel, Caddy's World, followed by this one, then Indigo's Star, Permanent Rose, Caddy Ever After, and Forever Rose. If I can remember that far back, it seems like I liked this one and Forever Rose the best.